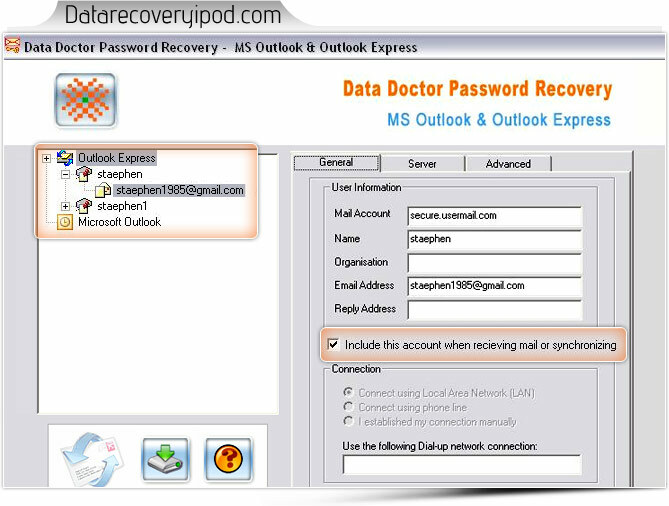 Outlook and Outlook Express password recovery software recover lost or forgotten saved e-mail and newsgroup account passwords configured on your Microsoft Outlook Express and Microsoft Office Outlook. The password recovery program restores all “Identities password” supporting with all versions of Outlook express and Microsoft office Outlook. This GUI based application is handy to use and retrieve all user records including server information (Incoming/Outgoing Mail Server account name and password). In addition, the software shows the complete list of Outlook Express users together with Identity passwords. The password recovery software is very easy to use and does not require any technical skills to operate. • Recovers all lost or forgotten saved Email and Newsgroup account passwords. • Show the complete list of outlook express users together with the Identity passwords. • Work with all versions of Outlook express and Microsoft office outlook. • Retrieve all user ID and password instantly. • Easy and safe to use password recovery program!